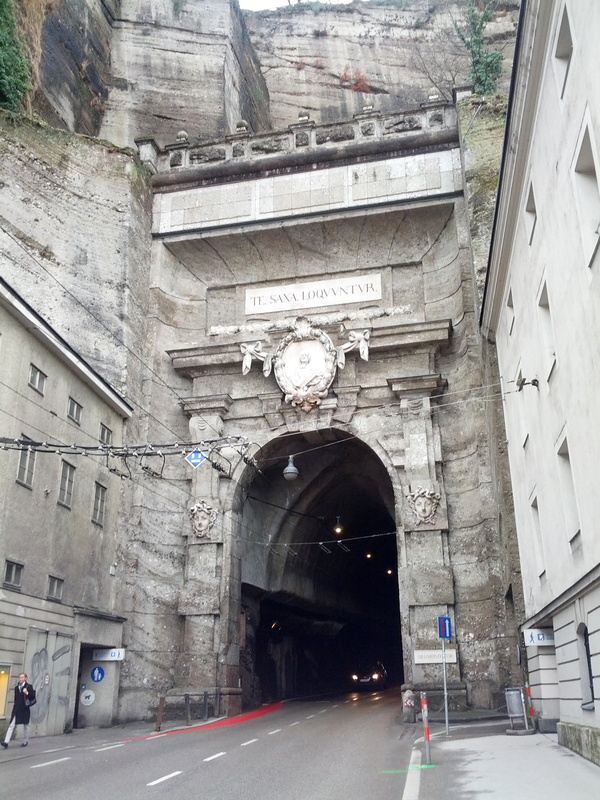 It was a quick trip to Salzburg. 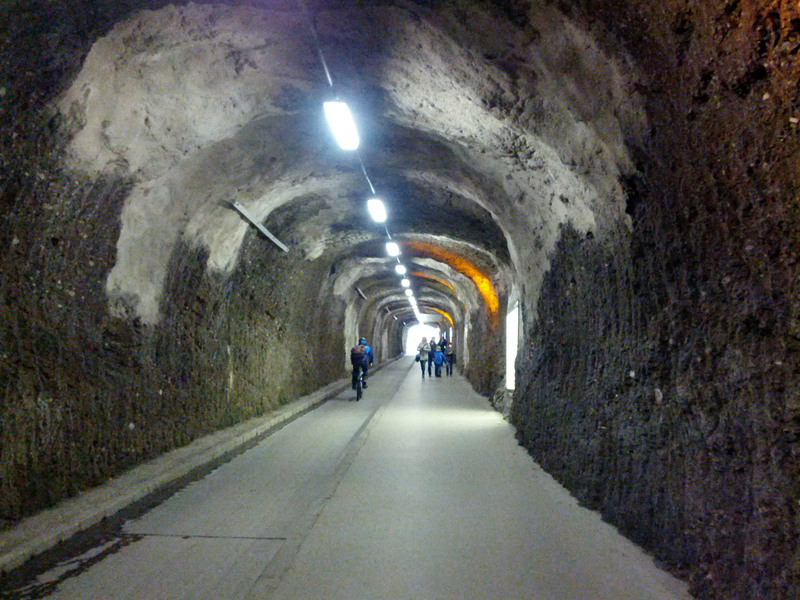 I left Vienna on the Westbahn, the local train with regular trips to Salzburg. I enjoyed the easy two-plus hour ride with roomy trains, leather seats, and wifi and in no time I arrived. I was greeted by the cold and rain. With my umbrella in hand and luggage in tow, I steadfastly made my way to my meeting point. I was connecting with my generous host for my stay in Salzburg, the cousin of my friend and host in Vienna. 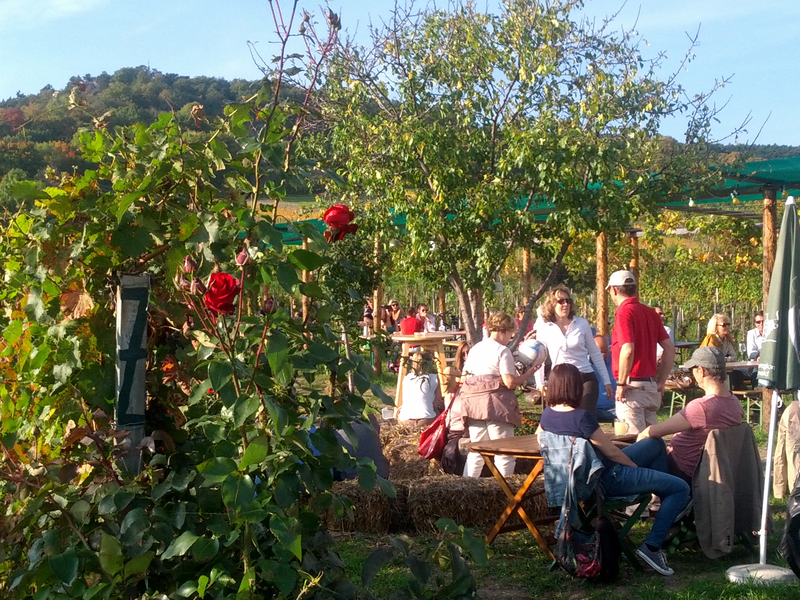 We met at the Cafe Wernbacher, a local establishment on the “new” side of town. I arrived soggy but in no time I was warmed with friendly company and peppermint tea. We had a great lunch including a soup made from a local root similar to garlic (I forget the name! What is that called?…) that grows fervently in the area, traditional Austrian prepared pork, risotto, and fresh kraut salad. It was a yummy and hearty beginning to my interlude. My purpose for going to Salzburg was part “business” as I was taking care of my visa needs for my new and upcoming adventure. 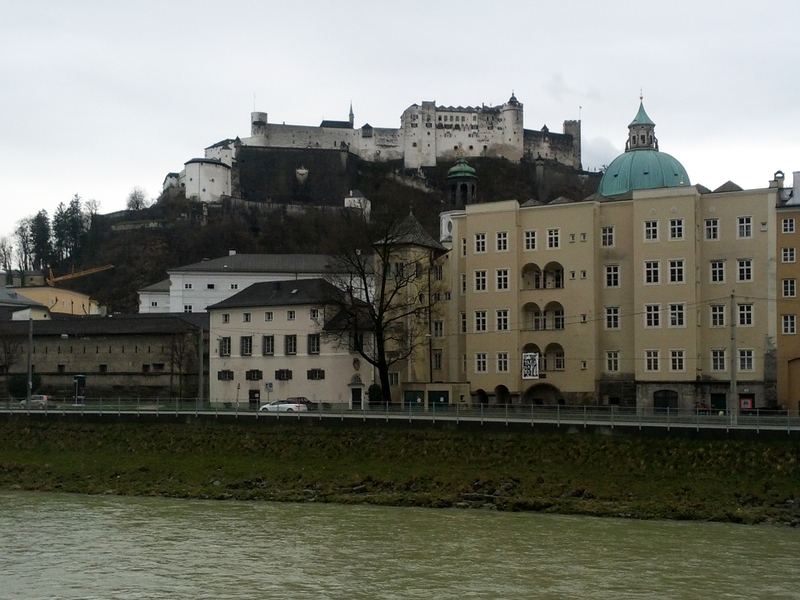 It was also a good reason to go to Salzburg and see a little bit more of Austria. 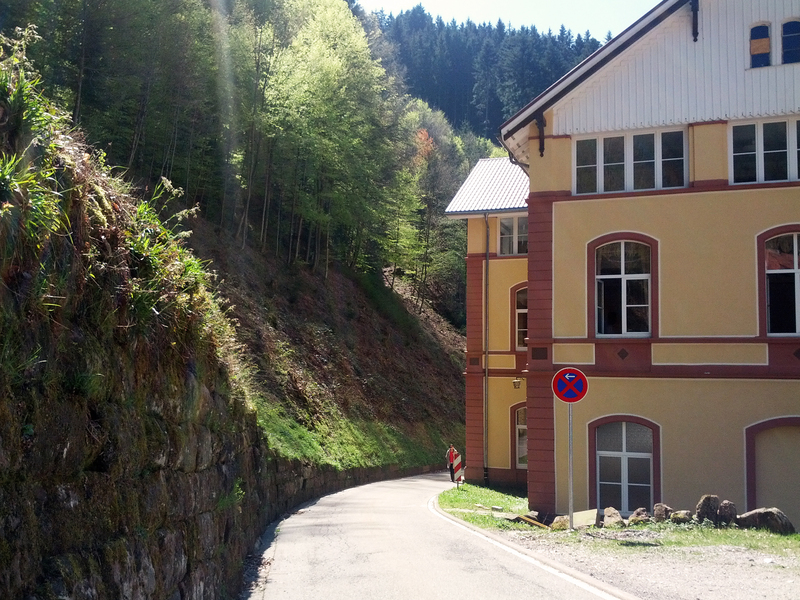 In fact, it turns out I also got to see just a bit of Germany as I went with my host on Monday just a hop, skip and a jump into Germany. We spent an easy afternoon there doing a little shopping and drinking tea. 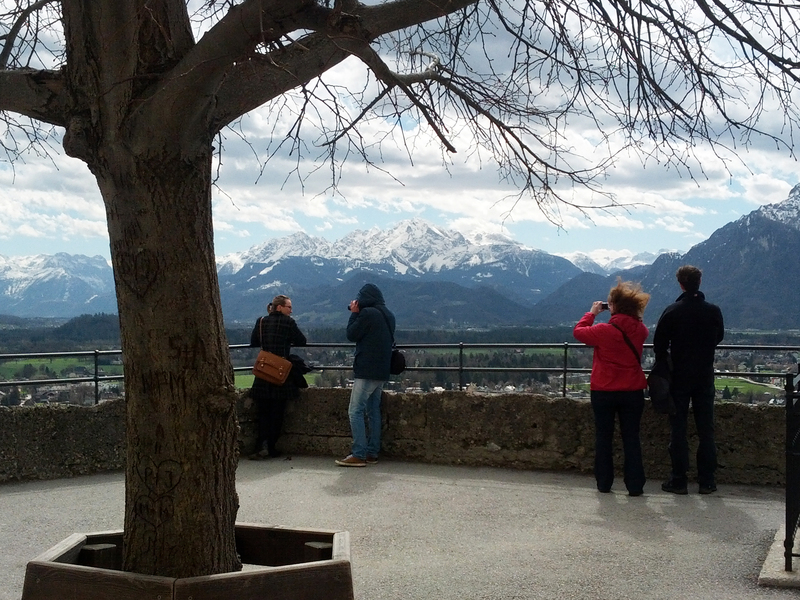 When I was reading up a bit on Salzburg, one of the recommended places to visit is the mountain Untersberg. There is a lift that takes you all the way to the top of the mountain. 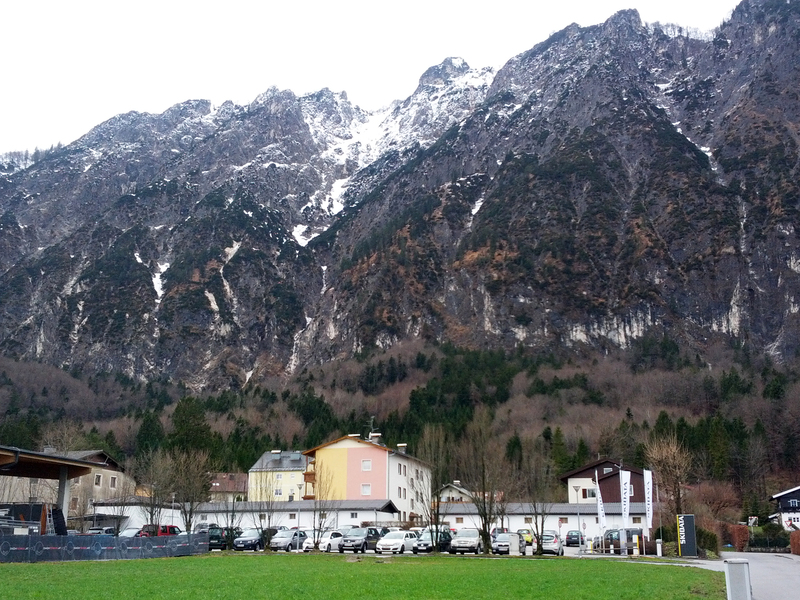 I had to laugh when I arrived at my host’s flat that she literally lived right next to that mountain. The tram that takes you to the top you could see out her back window. The next morning the first business of the day was getting my visa. Luckily my host did a “pre-run” the day before in her car showing me the way to the office neatly tucked away down a tiny street. She looked at the directions on the map and casually said, “Oh, you’ll walk through the mountain…” Walk through the mountain? 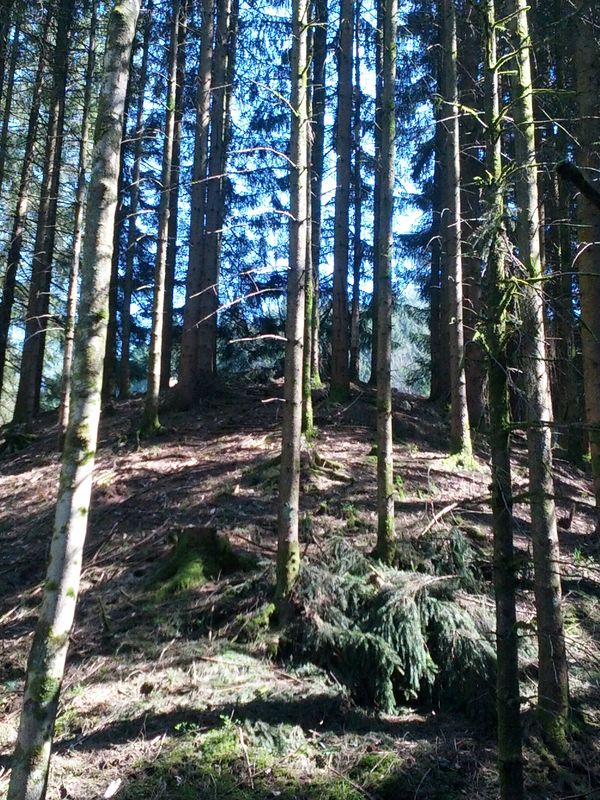 And indeed it was true, en route I had to pass through the mountain Monchsberg. A quick tunnel easily leading me through to the other side. 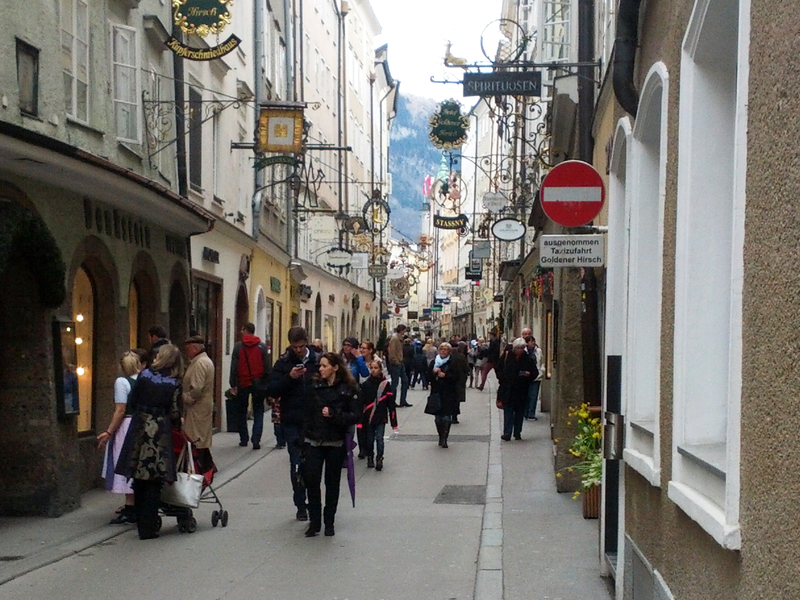 Afterwards, I meandered around the old town of Salzburg. 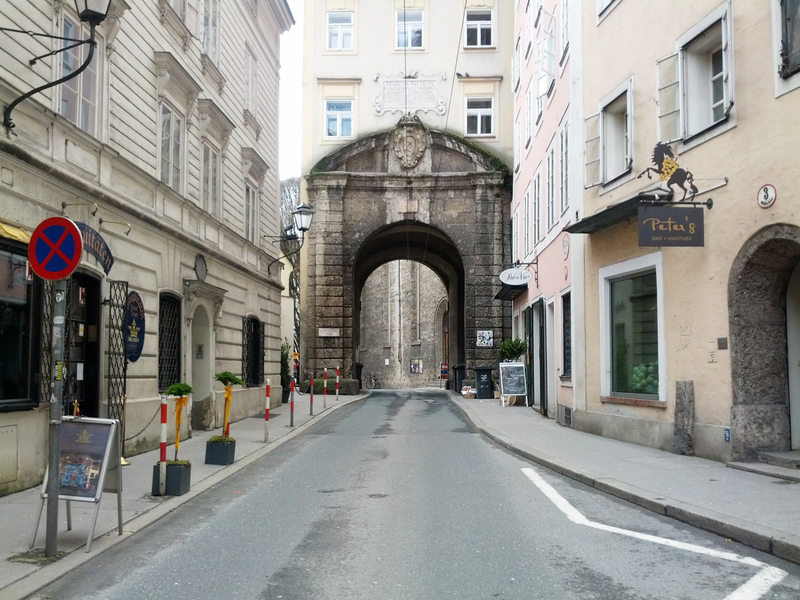 I shopped along the famous Getreidegasse. I took a peek in the Salzburg Cathedral (Salzburger Dom). 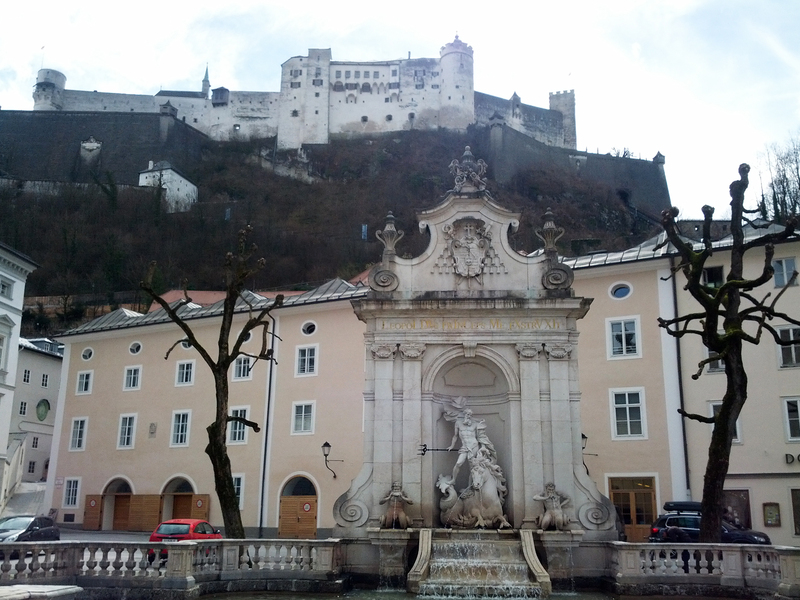 Soon I made my way to my next destination, the Fortress Hohensalzburg. 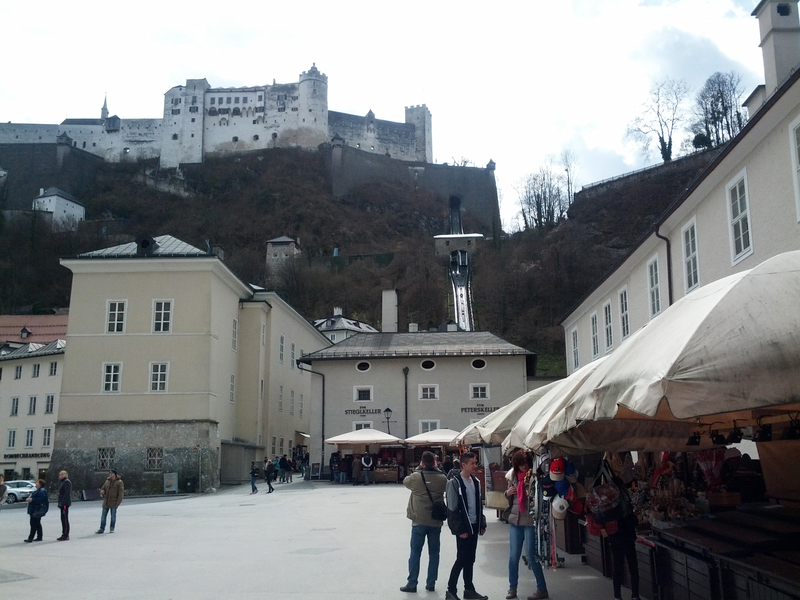 I bought a ticket on the U-bahn tram that goes up the mountain to the Fortress Hohensalzburg (you can see the tram in the photo above at the top center right). It was an easy breezy trip up, but when I arrived at the top I was in for a big surprise. When they opened the doors to the tram, the wind was whipping and people were blowing by like tumbleweeds. It took me a moment or two to get off the tram. I was a little less than enthused. I cautiously explored a bit, but the gusts were so strong that I and other guests periodically had to lean our bodies flat on the sides of the building for shelter. The wind lifted a table off the ground and nearly flung it over the rail. I went to the scenic lookout points, but I stayed far away from the edge for fear I would be blown away. I made my way around, took some pictures, visited the museum, but in truth I didn’t want to stick around for long in the crazy wind and mostly wanted return to ground level. Thankfully the descent down was smooth. I was grateful to be on the ground and made my way to get some lunch. While happily taking refuge in a local Bio Burger with avocado and zucchini, I couldn’t help but notice… it was a little windy down here too. Is Salzburg always this windy? It looked like a storm was moving in. So I escaped the weather to the local Europark mall and then made my way home in the evening. 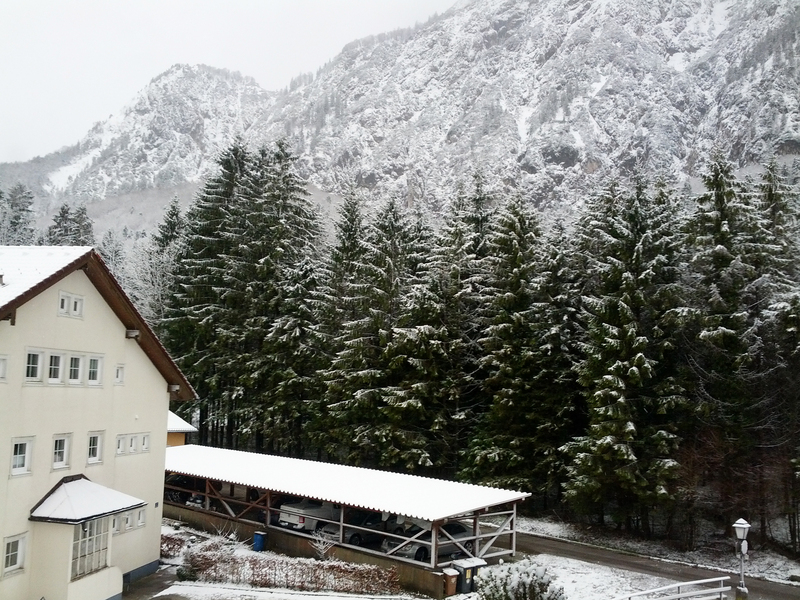 After a restful night sleep, I woke up the next morning to this…. 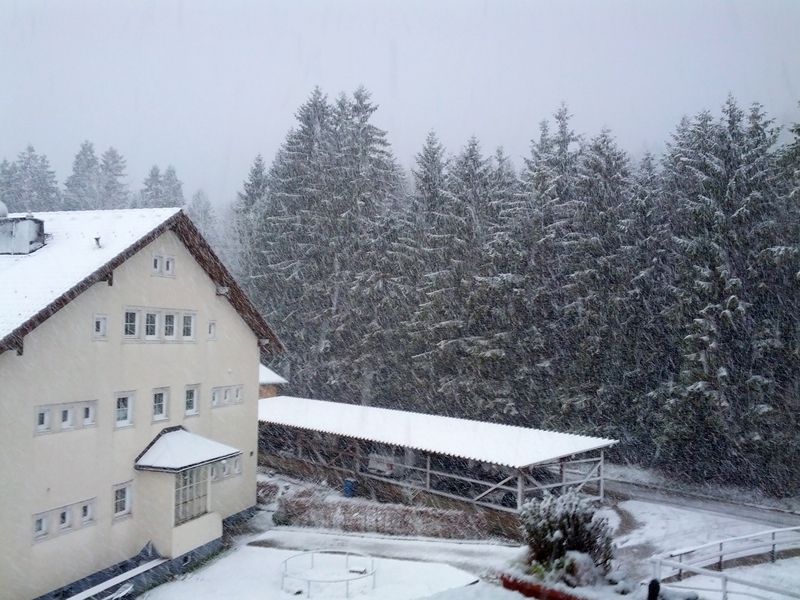 Hmmm… I thought… perhaps not the best day to do sightseeing in Salzburg. Later I connected with my host and we made the best of the day. We did a little shopping. The weather extravaganza continued with hail storms and a surprising peek of sun and blue skies. I learned that the wicked winds the day before and continued crazy weather were not typical Salzburg but in fact a real storm with an actual name, Storm Niklas. It even had hurricane strength winds! Not the best time to be on top of a mountain! We finished the crazy weather day with a late lunch at a local cafe called Cult, an eatery nestled in the Künstlerhaus (artist house) in Salzburg. I savoured my simple fish and salad lunch as its fresh taste and quality preparation melted in my mouth. A satisfying completion to a quick and quirky visit. I left, visa in hand, content to return to Vienna, but grateful for the diversion. Yesterday was Valentine’s Day. A day in truth I typically forget and don’t pay much attention to. When I exited the underground into the heart of the city, I was greeted by the always impressive Saint Stephen’s Cathedral and a feisty (in a laid back Viennese sort of way) assortment of costumed workers selling tours in a wide selection of languages. I turned the corner and noticed a few men selling brightly colored roses. I paid them no mind and continued on my way, enjoying the sunshine and focused on navigating to my tourist destination for the day. Ever the bad navigator, I walked in the wrong direction. But perhaps not wrong after all. I passed by an impressive building, doors open with a red carpet welcoming a steady collection of people. I paused and looked hesitatantly, curious what was happening. A kind man offered me a red envelope and then said something to me in German (which mostly I still don’t understand…) “Ich spreche Englisch…” I offered. 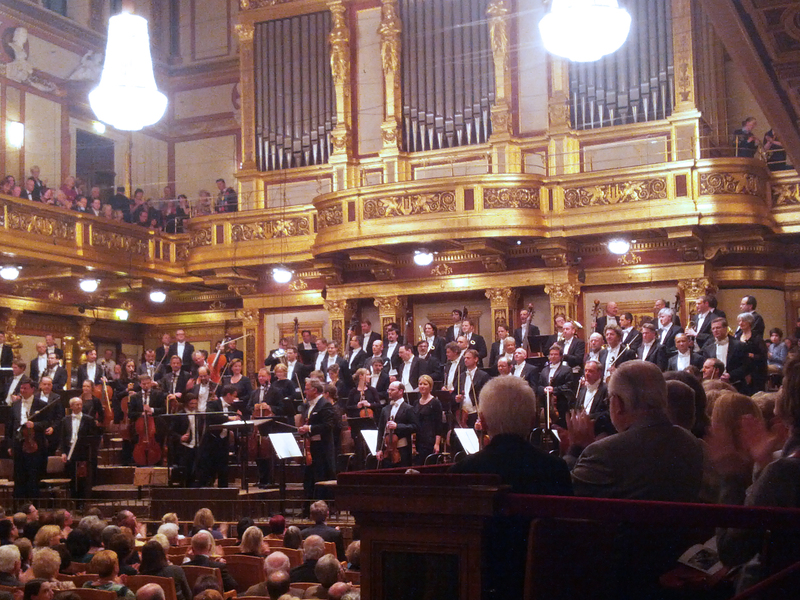 Like many Viennese, he easily flipped the switch and changed his conversation to English. “I have a Valentine letter for you from God” he said as he offered the red envelope in a friendly and gentle manner. The building as it turns out is the home of the Archbishop and once a year he opens the doors… on Valentine’s day. I was invited in for a spell to have some tea and rest a bit in the chapel if I like. “Sure” I said. Who am I to turn down a Valentine’s invitation from God. So, gratefully, I accepted the letter and made my way inside. I followed the red carpet elegantly escorting me into the courtyard with friendly yet reserved folks there to welcome me and others guests. There were lit torches along the pathway that eventually led to the chapel. At the entrance I was offered a sheet of paper to write down my prayers or intentions as well as some candles to light. I made my way into the intimate space filled with gentle music being played and sung live from the first few rows. I took a moment to pray and made and effort to hold back the tears and sobs that often want to come rolling out when I enter a place of prayer. I did my best to lay down my burdens for the day and took a moment to reflect surrounded by the quiet energy of the other visitors who seemed somewhat like me, a bit unsure but also enchanted by this unexpected diversion. I brought my written intentions to the front of the chapel and dropped them into the bowl collecting them, lit my candles and selected a bible verse printed on strips of paper in a bowl to the right. I took a glimpse at the verse thinking perhaps my A-2 level German had prepared me to understand just a bit…. but that was not the case. Shortly after, I left with my bible verse and Valentine’s letter from God, both in German to be understood or translated at a later time I suppose. But still, a gift nonetheless. After that, I continued on my way. I reworked my navigation, became clear I went (sort of) in the wrong direction, and shortly after arrived at my planned destination. But still, appreciative of my unexpected Valentine’s diversion and grateful for the gentle reminder of love and the simple but generous act of a small collection of volunteers in the heart of Vienna. Featured image, a burst of light through a narrow corridor in the heart of Vienna. 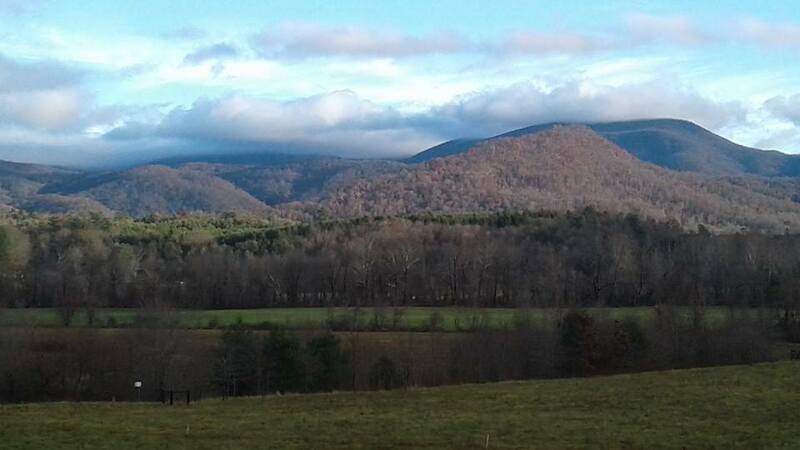 A friend of mine recently submitted the new featured quote for this Gypsy Woman blog. Her chosen theme couldn’t have been more timely… or appropriate. It’s message is, simply, that if we want to grow we will have to part with some things we are attached to… including, and at its base, habits and ways of life that are familiar to us. While I admit there is nothing wrong with a gentle dose of familiarity… sometimes our cherished habits and ways of being can set limits on our dreams, goals, wishes and desires. After nearly four years of international travel, parting with familiarity has in its own way become familiar to me. But still, it seems that each new destination requires that I strip off a layer of familiarity in the name of my own growth and development. I write this presently with an equal doses of pleasure in the foreignness of my new surroundings coupled with the inevitable sense of loss that comes with departing more familiar scenery. Each day in Vienna offers somethings new and inviting, but simultaneously are daily entanglements with my losses of familiarity. After living in South Korea for nearly two years, Vienna comes with certain comforts for this American bent mind. Most notably, it offers an alphabet I can recognize and a culture that is more at ease with speaking English. But oddly enough, in many ways Korea too became familiar to me… and so that is swimming in my pool of loss, change and growth. 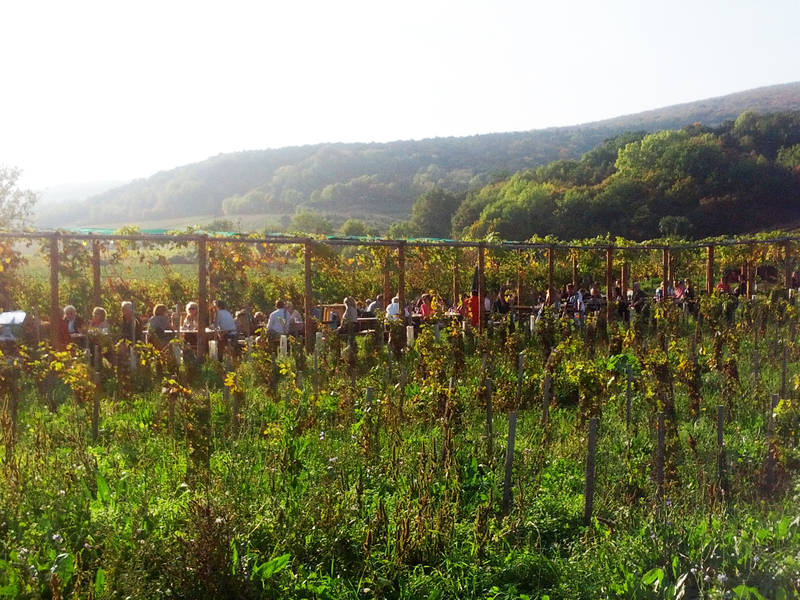 A wonderful traditional Austria meal overlooking the city from the Vienna Woods. A hazy overlook of Vienna from the surrounding woods. After five ultra beginner German classes, I am already knocking loudly on the door of unfamiliarity. My instructor shared just the other day that to speak German we will slowly have to let go of our own language… and not try to translate every word from German to English as often… you can’t. When first she said this I felt a little panic like being asked to give up a favorite childhood toy or blanket. But as I relax more with the German sounds and phrases we learn in class, I can see this makes good sense. Unfamiliarity and foreignness do have an allure and charm of their own. There is the innocence in exploring a new language and land. The child-like pleasure of learning to count to ten again and communicate the simplest of things in a new way. The simple pleasure of doing ordinary things, like going to the grocery store and finding new foods or spending new money. In my present circumstances, I am living with and assisting a family with the care of their child and family life. This too in many ways is unfamiliar. In my past years of wandering, I have taught the youngest of students and at times lived in community with a wide array of “others”. As most of my adult life has been independent living and the past four years a gypsy, family life lives in the realm of unfamiliar. It is new to me to sit next to my new young German-speaking friend and let her head rest on my lap as she trickles tears and wipes her nose after her mom and dad leave her alone with me for the first time. And still new to me to find my place, be of service, and meet my own needs within the life and patterns of an established family, generous and giving as they are. So this new beginning, as the others have been, is met with the push and pull of growth and loss… joy and challenge. And for now, for this moment, I am content with the balance of the two. After a lovely morning attending my german class, and now some quiet time in the afternoon to write, do yoga, drink tea… I am delighting in the balance. How about you? Any stories of growth to share? Any new explorations being met with resistance? If you’d like to share, it’s always great to hear from you! I was told yesterday would be the last warm day until April. Yikes! I woke up today to grey skies and chilly temperatures. Good-bye for now from the newly fall weather and historic streets of Vienna. I am at home on a cool Fall afternoon eating delicious leftover goulash. But this home is none that I have known before. I have left the midwest and my business in DC is complete. 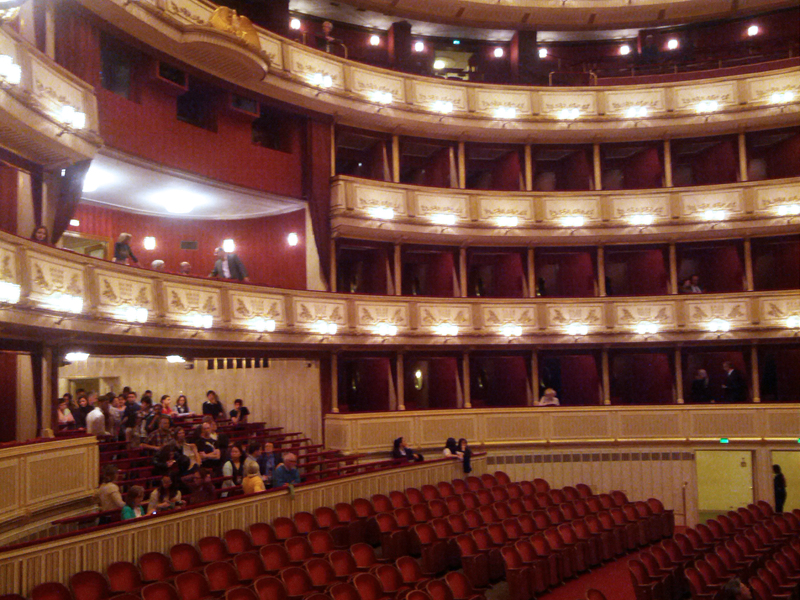 After a three-hour layover in Istanbul courtesy of Turkish Airlines, I now find myself… newly at home in… Vienna. How one gets from South Korea to the US and then to Vienna is no common road. I did not simply wake up one day and think… hmmm, perhaps I will go to Vienna. 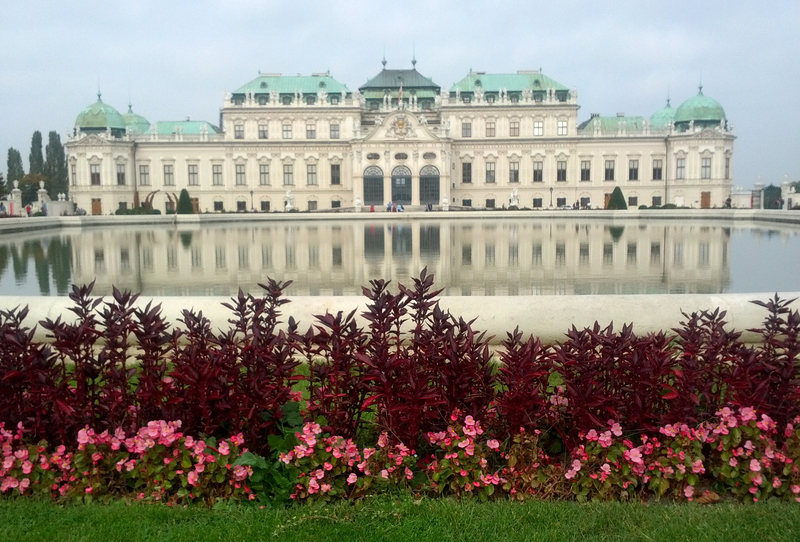 It seems, somehow that it was Vienna that wanted me to come to her… with of course, some mutual agreement. It began simply with an introduction. A friend noticed on Facebook that I have the exact same birthdate (day, month and year) as a friend of his in Austria. “Perhaps it would be fun to connect you?” he shared. Whole heartedly I agreed and we began exchanging stories of ourselves and lives, comparing notes from where our personalities and preferences were similar. She soon shared that she would be traveling twice to the US this year to work on an e-book project. When she mentioned her need to create a way to support her husband and child while she was gone, it didn’t take long for both of us to have the thought… that I could come to Vienna! A little anxiety, some well-organized planning, and an unexpected Visa trip to DC later… and before I knew it I was leaving Dulles airport on my way to Vienna. Over my past 3 1/2 years of travels, it has been purely by accident that each major destination is separated by a time of respite in the States. And so just as my mind and body start to sink back in my American ways, it is time to leave again. This transition is frequently met with at least a little distress but overshadowed by the excitement of what is to come. I find as I transition from one “life” to the next, it is easiest for me to stay in the present moment, take it one step at time, and allow the change to unfold in my reality as it happens rather than in the fortress of my mind and imagination. I was greeted at the airport in Vienna by an exuberant friendly face. I felt a rush of emotion as I saw face to face the woman I had been writing to and came to think of as friend. Her home was a pleasant taxi ride away from the airport and just minutes after my landing, I entered into the world of Vienna. 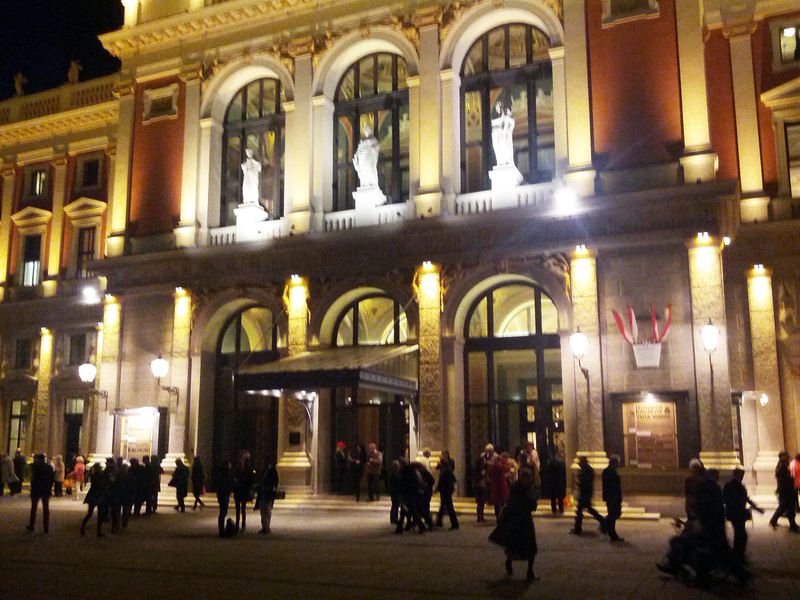 My first experience of Vienna was unlike any city that I had ever lived in before. Beauty and history gently surrounding me. 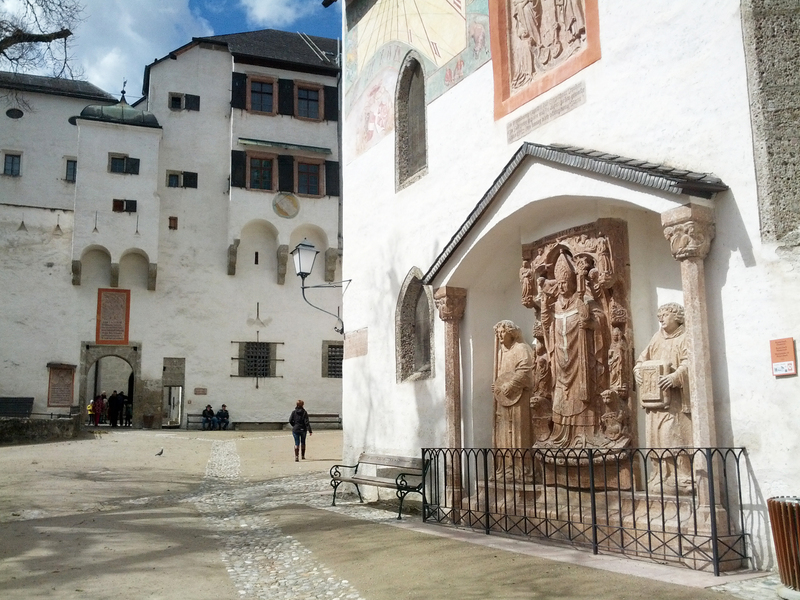 When we arrived at her home, I was shocked and delighted to enter into a lovely courtyard in the heart of the city decorated in Viennese historical stature. “This is your home?” I thought in delight. And for now, for a little while, it is also mine. I slowly began to move through my jet lag, spending much of my first day on my own in my pajamas. Today, however, I ventured out into the neighborhood a bit. I can’t help but be giddy and perhaps a little intimidated by the beauty, culture and architecture that surrounds me. Never before have I taken a walk around my local block only to easily stumble upon historical empires, museums and theaters. I left armed with a simple map and no real plan except to turn left when I exited the small corridor where their apartment is located. After being in Korea for nearly two years, it is a noticeable difference to begin to negotiate a city that, while still foreign to me, at least has an alphabet I can recognize. I couldn’t help but take note of how comfortable and at ease I felt wandering around. My friend and host shared that Vienna is a safe city. And while you may still have your pickpockets from time to time, there is not much to be concerned about. That was apparent in my little outing today. Even when I had ended up in an area where I was “not quite sure where I was”… I felt in my bones that all was well. And now here I am, content to have successfully negotiated my way home. And more content to feel the warmth of inside and enjoy more of my hosts delicious cooking. I begin to delve into the German language on Monday with a beginners German class that will meet three times a week. It is a great treat for me to be entering a new country with the opportunity to study the language in a more formal way. My hosts are quite generous giving me time and space to first settle in and adjust to my new environment. Good-bye for now from my new place in the world. I am grateful for some quiet time as I ease into a new chapter of life and adventure in Vienna. Featured photo: A sneak peak of the courtyard from my cumfy room here in Vienna, Austria.